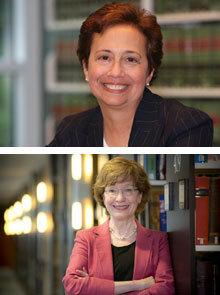 Fordham University School of Law visiting professor Tina Stark (top) and Emory Law professor Sue Payne. “Educating the Transactional Lawyer of Tomorrow,” Emory Law’s Fourth Biennial Conference on Teaching Transactional Law and Skills, will be held at the law school June 6-7. The conference opens mid-day Friday, June 6, with remarks by Fordham University School of Law visiting professor of law Tina Stark, who founded Emory Law’s Center for Transactional Law and Practice in 2007. Stark's lecture, “What Cornell Veterinary School Taught Me About Legal Education,” will examine her ideal law curriculum. Saturday’s keynote discussion, “Skills is Not a Dirty Word: Identifying and Teaching Transactional Law Competencies,” will be moderated by Sue Payne, the center’s executive director. The conference is open to the public, but registration is required and closes May 30. Register here.